Counting Sheep Corner is a favourite of one of our regular readers. We can tell why as it is a relaxing, spacious café serving some delicious dishes. There is limited seating outside. The interior is dominated by a large table and there is also some window seating. Glass ccounters show off the various fresh pastries, breads, croissants, corn fritters, muffins, tarts and sandwiches. Waitstaff seemed to be far and few between so we seated ourselves to peruse the menu. Ordering is done at the register as is payment after the meal. Water is self service near the entrance. One of the two frappe specials was apple and mint ($5). The first sip was a bit of a shock as we were not sure what the tingling sensation was. It didn’t take long to work out that soda water had been added. This was certainly an unusual addition and had mixed reviews from people at our table. While refreshing, we would have preferred more fresh fruit as opposed to the soda as it did result in the frappe tasting too much like cordial. 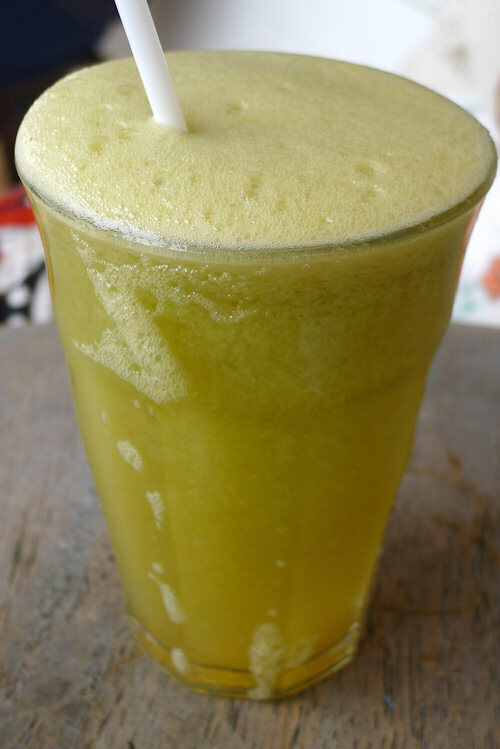 Regular readers will know that we are big fans of cafés that squeeze their own juices. In that case, points to Counting Sheep Corner for the variety they have on offer: orange, apple, pineapple, pear, banana, beetroot, ginger and carrot. It’s up to you to make your own combination. 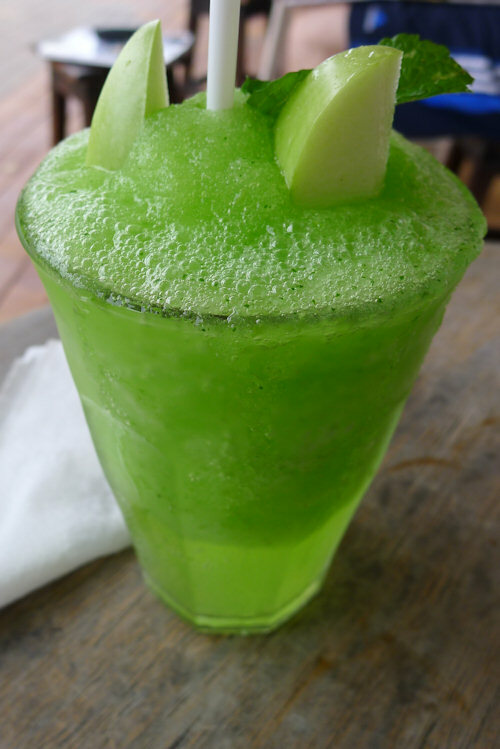 We opted for apple and pear ($5.50) which was nothing but fresh juice and hard to fault. Seeing none of us has coffee today, we should point out at this point that it will set you back $3.30 for regular and $3.80 for large coffees. CSC also have a big selection of teas. 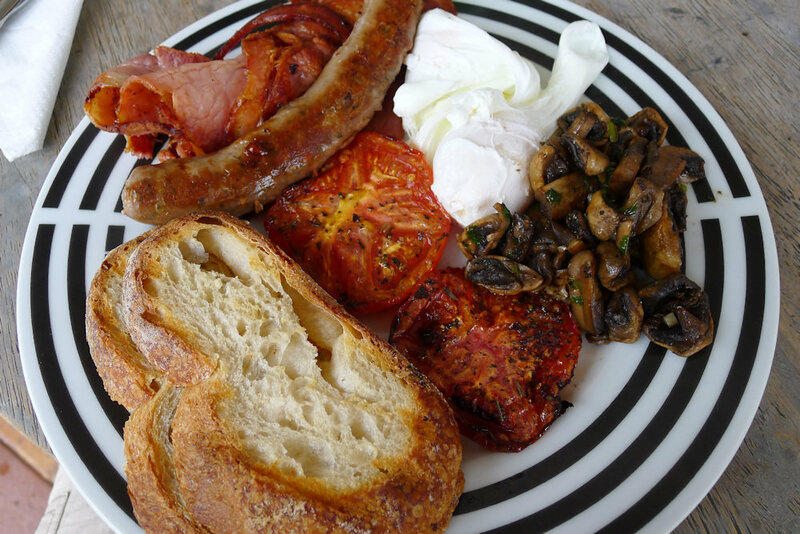 The big breakfast ($14.90) contains all the usual suspects. The two eggs can be ordered any way. They were cooked longer than usual but were still slightly runny. One even took on the shape of a chicken drumstick! The tomatoes had been roasted to within an inch of their life but the pepper and spices worked well and the end result was very tasty indeed. For the price of this dish we were surprised at how large it was and the ample amount of bacon we received. The bacon was also deliciously crispy. 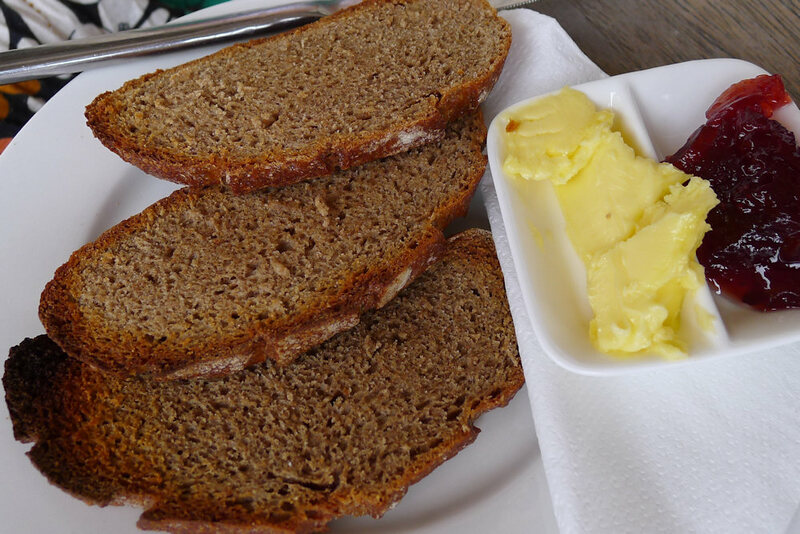 The bread was quite tough and combined with the very thin top edge of the knife provided made for quite an uncomfortable cutting experience – something we wouldn’t ever have thought we would experience dining out! It’s hard to comment on the dish of toast with jam ($5) but we’ll try our best. The dark rye was delicious and crunchy. The jam was rather plain and could do with some chunks of fruit in it. 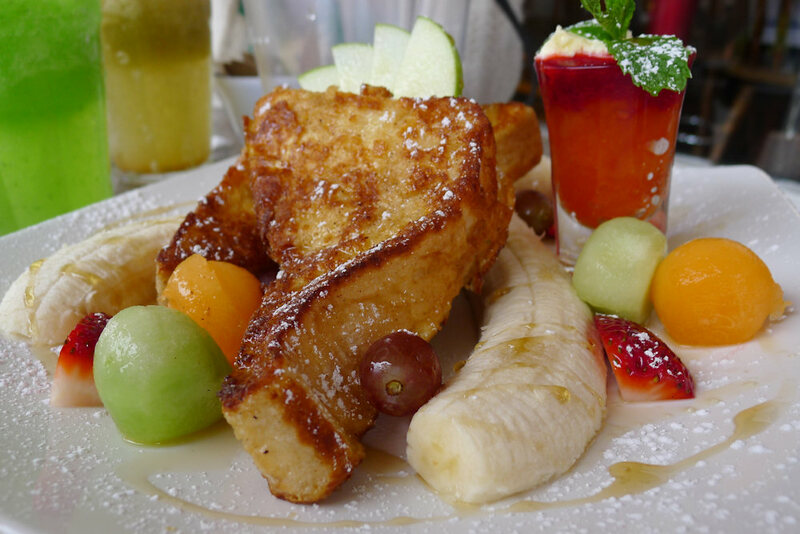 The French toast ($12.50) can best best described as a “party on a plate”. It was bright, colourful and beautifully presented. Despite the fact that it was served a good five minutes after the other dishes (and the side of bacon another five), the French toast was an instant hit amongst all. The fruit (melon balls, banana, grapes, apple and strawberry) was all very fresh while the papaya raspberry coulis was something we hadn’t tasted before and packed a fantastic flavour punch. If you want to show off some Sydney café flair to out-of-town friends or relatives, order this dish for them. Our experience at CSC was a great one. 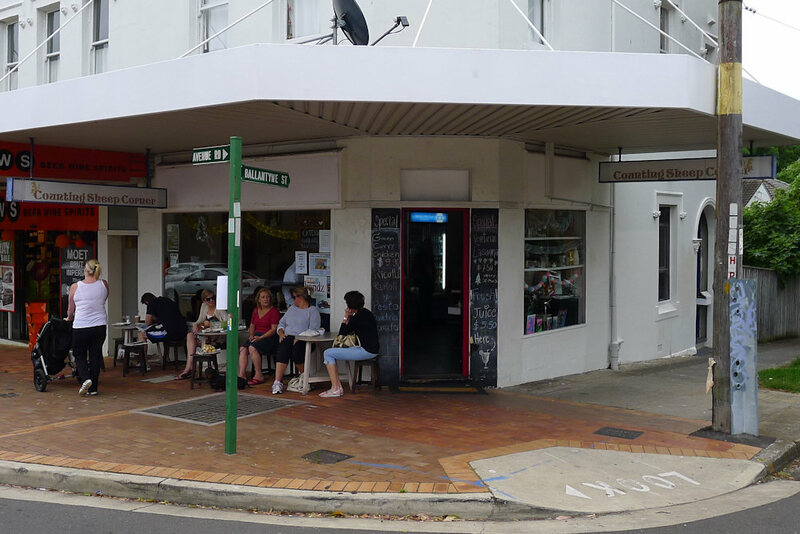 This has also been one of the most affordable cafés we have visited – and it’s in Mosman! Both the breakfast and lunch menu have enough variety to warrant return visits and we found the atmosphere to be relaxed and friendly. Points were taken off for service because of the late arrival of some dishes as well as the length of time we noticed empty dishes sitting at other tables while birds pecked at it and new guests arrived, pushing it aside. CSC is located on a busy intersection with plenty of shops close by. There is a green grocer that sells flowers, a newsagent and gourmet deli. After breakfast we recommend a visit to Balmoral Beach which is close by, or for the more adventurous Taronga Zoo. Bring a packed lunch as the lunch prices in the area aren’t as affordable as breakfast. We used to live around the corner from Counting Sheep. Ever since we’ve moved out of the area we’ve missed it dearly. To put things into perspective, we’ve actually driven 40 minutes, battling Mosman traffic on a Saturday morning just to eat back here again!